Are you looking for the freedom that an RV gives, the chance to hit the open road and get some fresh air? Are you looking to go on an extended vacation, or perhaps just for a weekend getaway? Well Young's RV in Fremont, Ohio presents to you the all NEW 2019 Teardrop Camper manufactured by nuCamp RV. The T@B Teardrop Camper is built in Sugarcreek Ohio, the heart of Ohio's Amish Country. Now a large and modern state-of-the-art manufacturing plant, this company employs skilled craftsmen and women who are dedicated to producing the highest quality of Teardrop campers available in the United States. The T@B 320 model S offers the traditional U-Floorplan with respect to both kitchen and sleeping areas, but you trade out your cabinet and climate control footprint for a wet bath. There is plenty of seating with the u-shaped dinette with storage beneath all of the benches, as well as along the back wall up above. When nightfall arrives, you can easily fold down the table and create a 70" x 73" sleeping space for 2. 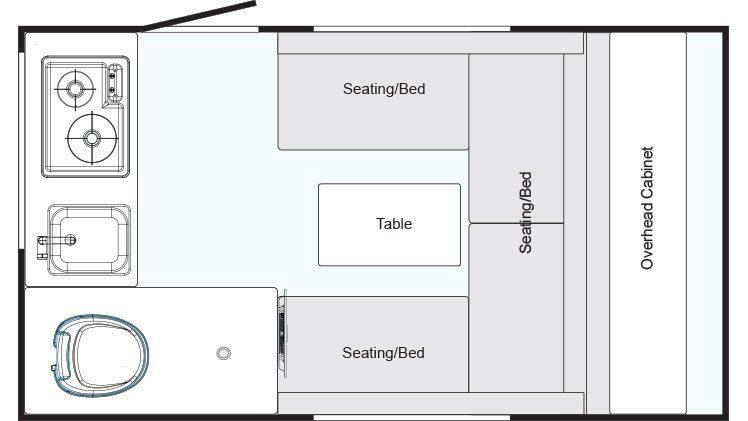 The front of the trailer offers a sink, glass-top stove, and 3-way refrigerator along with the placement of the wet bath (including a shower and toilet). This T@B 320 S model includes the Boondock Edge Package, Convenience Package (LED lights, alloy wheels, spare tire, electric brakes, acrylic dual pane windows, night shades, and tank / battery monitors & disconnect), and 133-Watt Solar Roof Package. This unit is perfect for anyone craving adventure. So why not stop in at Young's RV for a closer look?